AdsMinded WordPress Adsense Theme With Widgets! It’s been so long since I last updated my AdsMinded WordPress Theme. My Apologies. Today, I’m rolling out the widgetized version of AdsMinded for both AdsMinded Original and AdsMinded Wide layouts. With this new version, you are now able to add advertisers’ codes into the ready-made widgets resides in sidebar, centerbar, squarebar & header. There is no need to mess with the template codes anymore! See picture below for better illustration. My personal Gmail account was running out of space before I did a massive clean up couple weeks ago, by deleting all emails with large attachments. Well, now I’m expecting such problem will not occur again after this official news from Gmail blog. At the moment, Gmail storage is ever increasing as part of their “Infinity+1” storage plan. Now Gmail is going to speed up the counter and giving out more free storage as time passes by. In other words, it simply means you’ll be rewarded with more and more storage space in every second, every minute and everyday! I am a few hours late to wish Google their 9th birthday. In fact, I saw the change of their search logo in the midnight yesterday. 2 years ago, I wished them Happy Birthday on September 9th 2005, which was 2 days late from their actual birth date on September 7th that time of year. Somehow this year the celebration of Google birthday is delayed until the end of September. So, now I am confused which date is their actual birthday. The exact date when we celebrate our birthday has moved around over the years, depending on when people feel like having cake. I’m not sure have you guys come across this cute little fox. Hi Everyone, I am Foxkeh. 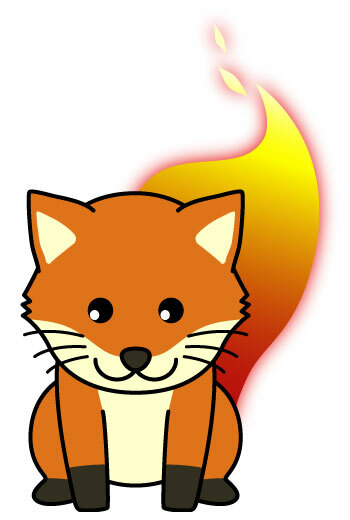 Let’s meet Foxkeh, the mascot of Mozilla Japan! This little fox was named Foxkeh after FIREFOX and SUKE, the suffix of common boy’s name in Japan. It was created a Mozilla Japan staff for Firefox promotion in Japan but it is not a mascot character of the Mozilla Firefox. Hence, it will not appear either in the default theme or icons of the Firefox. It’s a pity Foxkeh is not made as th official mascot because it’s uniqueness truly represents Firefox in my opinion. Foxkeh has become more popular since its appearance in last September. Even it’s now available as a Spread Firefox! affiliate banner. If you are not using Firefox for web browsing, I would highly recommend you to start using Firefox as your default web browser.